VPR’s membership drive is off to a great start, with nearly $100,000 raised so far. If you love Vermont and food (and who doesn’t?) and haven’t made your contribution to VPR yet, you’ll want to do it now to be entered into two exciting prize drawings happening tonight and tomorrow morning. Tonight (Wednesday) at 7 p.m., we’ll give away a relaxing getaway for two at Shelburne Farms: a two-night stay at the historic Inn on the shores of Lake Champlain, along with a gift basket, dinner and brunch at its legendary restaurant. Tomorrow (Thursday) morning at 9 a.m., we’ll give away a $1,000 gift certificate to one of four local food co-ops around the state, where you can stock up on local food and products to create your own legendary meals at home. Click here to support VPR and enter the drawings now! 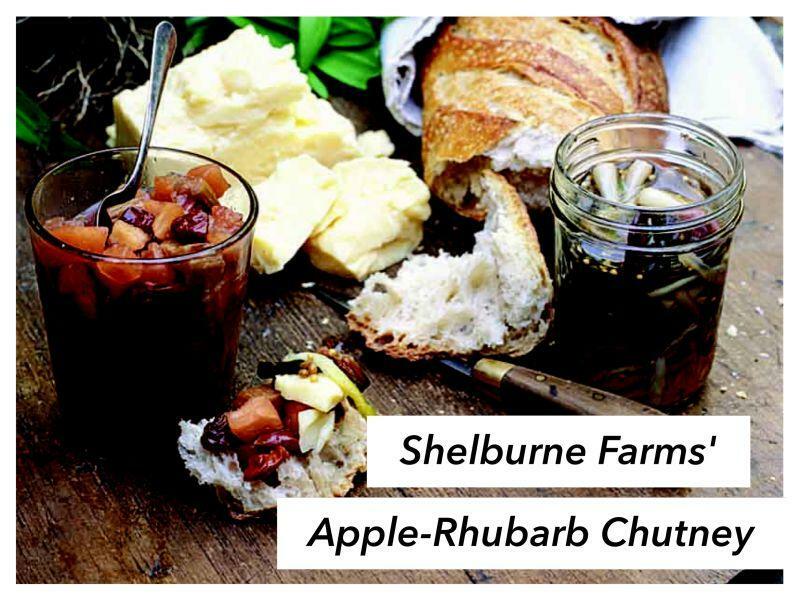 And just because we love you and know the rhubarb is still growing like crazy in these parts, enjoy this recipe for Apple-Rhubarb Chutney from our friends at Shelburne Farms. And thank you very much for supporting VPR. You make everything we do possible. Apples in this chutney should hold their shape and can be fairly sweet, as the rhubarb more than delivers on the tart quotient. Try Braeburn, Empire, Fuji, Northern Spy, Paula Red, or Winesap. When rhubarb starts popping up in May in Vermont, even long-keeping local apples are pretty much done. Rhubarb, however, will produce all season long if you keep cutting it and the weather doesn’t turn scorching. In fact, the thicker later-season stalks work especially well in this recipe. Frozen rhubarb will also work fine; you just may need to simmer the chutney a little longer. If you can’t find rhubarb, use a total of one cup of dried sweetened tart cherries instead. In a medium saucepan set over medium-high heat, combine the cider, maple syrup, cider vinegar, and rosemary. Bring to a simmer and cook for 5 minutes. Carefully remove the rosemary sprig and discard. Stir in the apple, rhubarb, and cherries. Simmer for another 5–7 minutes until the fruit is just tender but not mushy. Cool and store in a clean jar in the refrigerator for up to two weeks. VPR's June Membership Drive is June 10-21 with a goal to raise $325,000, which helps pay for all of the news, music, and conversation you rely on. I hope you'll join VPR or renew your membership today, and check back here throughout the drive for updates. Update for Saturday, June 21, 12:26 p.m.
Update for June 30: We have a winner! "Mikaela's Dancing Chicken," pictured above, received about 40% of more than 600 votes cast. The design was created by Mikaela Luke-Currier of Randolph Elementary School. Her art will be featured on a VPR t-shirt this summer. Stay tuned. Update for June 10: Voting is now open! Click here to view the six finalists and vote for your favorite. Voting ends Friday, June 27. VPR is giving away several drawing prizes during this membership drive. The sooner you make a gift, the more chances you have to win!